Erica McKenzie, professor of large animal internal medicine at Oregon State University’s Carlson College of Veterinary Medicine, discusses muscular disorders that can affect athletic horses. The equine muscular system is the engine room of the horse, comprising over half of the body mass of Thoroughbreds. At the cellular level it is a complex system, comprised of a vast array of specialized proteins that coordinate functions ranging from power output to heat management. Muscle disorders are very common in athletic horse breeds because, surprisingly, they can also provide some beneficial effects, ranging from enhanced muscle mass to economic metabolism. Given the importance of the muscular system to athletic performance of the horse, not surprisingly, it has attracted considerable research focus. In the past two decades, “tying-up” up in athletic horses has been teased into at least three distinct disorders, which are heritable and therefore tend to have strong breed predispositions. Several other heritable muscular disorders of horses have also been defined, causing problems ranging from profound weakness to respiratory paralysis and early neonatal death. Advances in medicine now permit convenient hair or blood tests for many of these diseases due to their genetic basis, and breeders are encouraged to display appropriate stewardship by testing their breeding stock for known disorders that have scientifically validated genetic tests available. Current research efforts are attempting to identify the genetic signature of the disease-causing tying-up in Thoroughbreds and Standardbreds, which has proved challenging, and the disease-causing tying-up in Arabian horses. Advanced molecular techniques are also being applied to some disorders to determine exactly what goes wrong at the cellular level, to help define the basis of clinical signs and to better direct the development of effective genetic tests. Currently, the most clearly defined muscular disorders of athletic breeds are polysaccharide storage myopathy (PSSM), hyperkalemic periodic paralysis (HYPP), and glycogen branching enzyme deficiency (GBED), because the cellular nature of these diseases and the underlying causative genetic mutations are largely defined. PSSM is common in Quarter horses and related breeds, and typically causes signs of tying-up. It is also linked to high body condition, which can be desirable in those breeds. HYPP causes weakness and paralysis and, occasionally, death. It is also associated with high muscle mass, and therefore became prevalent due to positive selection pressure for this trait. GBED is an inevitably fatal disorder of Quarter Horses and Paints, causing weakness and death in the first days to weeks of life. It is uncommon, and association with a positive trait is not recognized. All three of these disorders can be readily tested for on hair or blood. Standardbred and Thoroughbred horses appear to share a disorder causing tying-up during training, with clinical signs rarely or never seen during actual racing exercise. This disease is referred to as recurrent exertional rhabdomyolysis (RER). 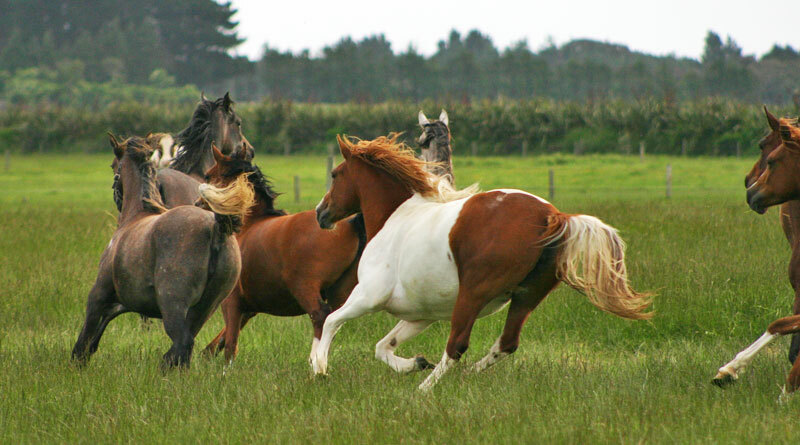 It appears to be more common in faster horses because it might permit more rapid muscular processes at the cellular level, hence there has been positive selection pressure on this disease. The genetics of RER have proven frustrating to define despite many years of work. Warmblood and Arabian horses might also share a disorder recently coined as “myofibrillar myopathy” (MFM). Signs of this disease appear to consist of tying-up in Arabian horses, and poor performance and poorly defined movement abnormalities in Warmblood horses. The genetic cause of MFM is not known and no scientifically validated genetic tests exist for MFM or RER. In summary, muscular disorders are common in athletic horses, and can be frustrating and even fatal under some circumstances. Association with specific positive traits has contributed to the prevalence of some of these diseases. Genetic testing is available for many heritable equine diseases, and it is likely that testing for less clearly defined disorders will be developed in the coming years. Genetic stewardship relies on breeders being educated about heritable disorders, and performing proactive breeding selection processes to produce horses that are not only high performers but also genetically sound. This report was first published in Equine Disease Quarterly, funded by underwriters at Lloyd’s, London.